Né le 30 Mai 1849 à Southampton dans une famille de marins, William Gregory était entré à la LSWR à l'âge de 20 ans en tant que matelot breveté ayant auparavant navigué en Amérique du Sud où il avait échappé au naufrage de son navire dans le Rio de la Plata. Jeune homme capable et intelligent, il était deux ans plus tard troisième officier puis Second en 1871. En 1875, la Compagnie lui offrait un poste de Capitaine temporaire et il effectuait alors des remplacements jusqu'à sa titularisation en 1880 comme Capitaine du SS Honfleur alors qu'il recevait son certificat de compétence délivré par le Board of Trade, l'autorisant à exercer la fonction de Capitaine. De surcroît, il était titulaire du certificat de pilote pour les ports de Southampton, Jersey et Guernesey. .Après plusieurs affectations, il était nommé au commandement du Hilda en 1895. Il n'est pas nécessaire de préciser qu'en 1905, il était entré des milliers de fois dans les passes de Saint Malo. Marié et père de 4 enfants, il résidait au 78 Tennyson Rd à Portswood, un quartier de Southampton. 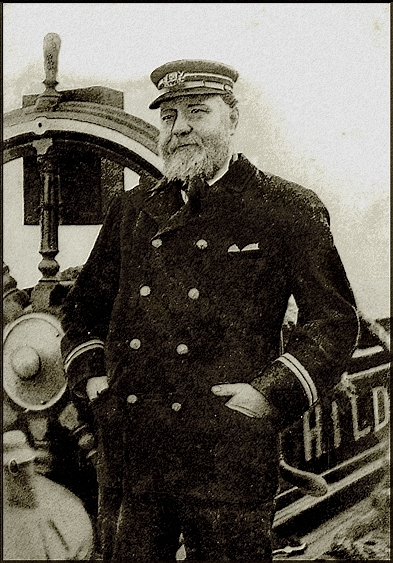 Born on May 30th, 1849, William Gregory came from a seafaring family and had spent his entire adult life at sea. Apprenticed to a Southampton firm, his first voyage took him to South America where he survived the wreck of the vessel in the River Plate. After completing his apprenticeship he had joined the LSWR's service at the age of 20 in 1869, serving on various of the Company's ships. After being Acting Master from 1875, he was confirmed as Master in 1880 when receiving master's certificate of competency from the Board of Trade and attached to the SS Honfleur. 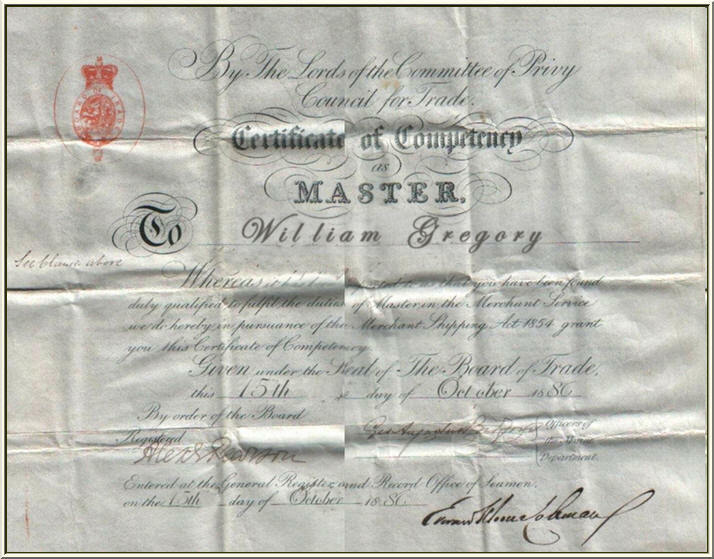 Besides his Master’s Certificate, he held pilotage certificates for Southampton, Guernsey and Jersey. After several attachments on various ships, he was appointed in 1895 as Master of the Hilda. Needless to say that in 1905 he had entered Saint Malo Roads thousands of times. 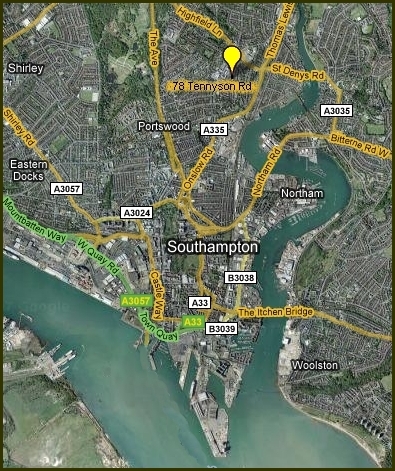 Living at Southampton, 78 Tennyson Rd in Portswood, he was married and had four children. Vers trois heures de l'après-midi, le 20 Novembre 1905, le corps sans vie du Capitaine Gregory était retrouvé dérivant en mer devant Saint Malo. Funeral service of Captain Gregory was held on Tuesday November 28th at St. Deny's Church followed by the interment at Southampton Old Cemetery Section Q105, Grave Number 152. Sépulture du Capitaine Gregory et de ses parents décédés l'année précédente. La pierre tombale s'est brisée à proximité de sa base ce qui fait que la plus grande partie est tombée. La partie inférieure qui porte la fin de l'inscription est restée à sa place dans le sol. Grave of Captain Gregory and his parents deceased the previous year. The tombstone has been broken near the bottom, so that the greater part of it is now lying flat, and only the bottom section with the last part of the inscription is still upright in the ground. "Dear child weep for me no more nor husband shed a tear for I am gone but just before unto our Saviour Dear"
"In their death they were not divided"
"Thy Will Not Mine O Lord"
Et pour finir, cette lettre reçue de l'un des descendants du Capitaine Gregory, une lettre qui fait comprendre combien est utile ce devoir de mémoire. As the descendants of Captain Gregory, we are very happy to have come across your website and, after so long, to get in touch with you. 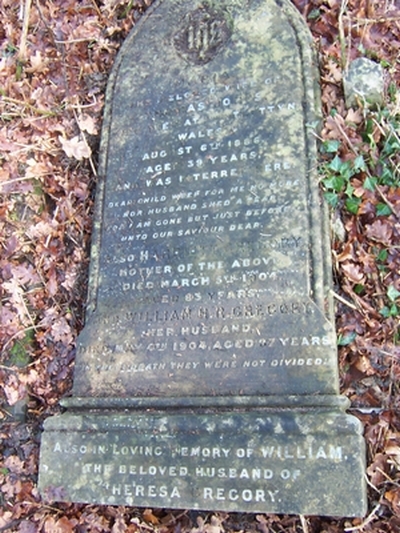 As children we were only vaguely aware that our great grandfather, Captain William Gregory, had perished with his ship and although we were shown his picture and an account of the events of 17th and 18th November, 1905 in the local paper, the manner and extent of the tragedy and the bereavement of so many families were not fully appreciated at the time. Over the years it became a distant recollection and finally less mentioned if not forgotten. In fact, I do not know if the tragedy was ever commemorated in Southampton, the Captain's home town and where many of the passengers and crew on the Hilda came from and where nearly all our family were born and brought-up but, sadly, we have no recollection of any special services taking place over here in memory of those tragic events. 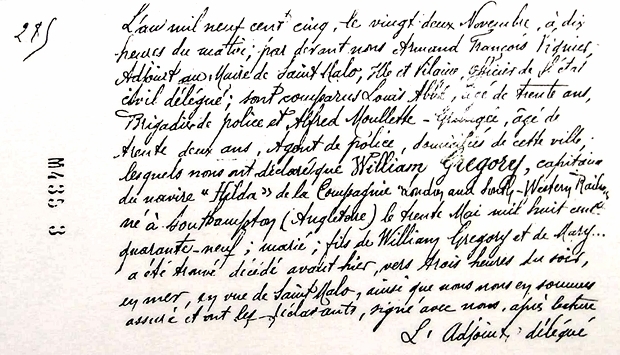 It is really only with the development of the Internet and the Search Engine that, at last, we have succeeded, through your site, in finding more details about the sad sequence of events and learning how the people in St. Malo and the descendants of the Breton" Johnnies" remembered and honoured their loved-ones and continue to do so, to their great credit. 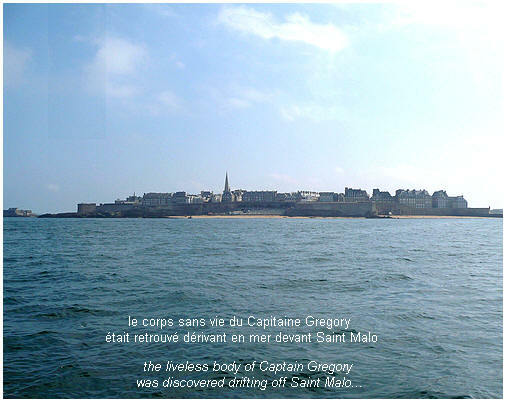 I am sure this will seem strange to you who have taken such a deep interest in the story but we were completely unaware that such an important and moving service was to be held for the centenary in St Malo in 2005. Had we known we would certainly have wanted to be there to join you in remembering our relative and those who went down with the Hilda.It must have been a very emotional occasion. I would be interested to know if any of the English descendants attended or were invited to attend the commemorative service ? Did our town send a representatve? Do you have any contact with the people of Southampton? I do hope so! Well, that is in the past and it is better now to talk of possible future involvement. First may I thank and congratulate you on your dedication to the Hilda story and for keeping the story alive and hope that your Association continues to develop as you would wish. I have called us "we" and there are quite a large number of Captain William Gregory's descendants. We are not certain how many children Captain Gregory had and I intend trying to find out in the coming months but we are direct descendants through his son, Albert Gregory ( our grandfather) who was, for a time, a merchant sailor employed on liners sailing from Southampton. In those days large families were common and he with his wife Maud had eight children ( two, twins, died at eighteen months) three boys and three girls of whom one was my mother, Rachel Gregory. There are at least ten great grand children of the Captain and , of course, we are all in our sixties and older and have children and grandchildren of our own to add to the "clan". 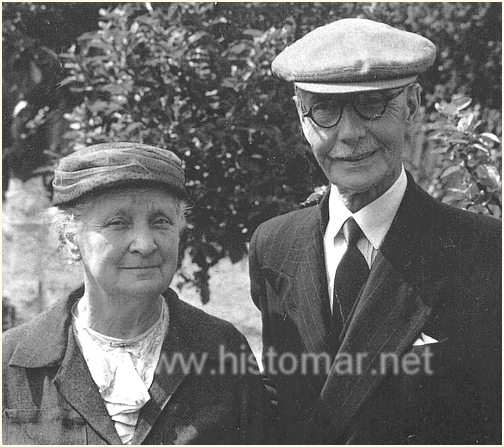 In fact one of my grandchildren, aged seven, has taken a great interest in the story of the SS.Hilda and Captain Gregory and it was partly her enthusiasm and curiosity that led us to your site and Histomar and the Association which we would like to join. Remerciements particuliers à John Adams, Alan Gregory et Dave Jacobs, Archiviste, Assoc. "Amis du vieux cimetière de Southampton"